Thought I would throw this in for your evaluation. While my announcer and I have it out, over his dent in my production budget. I plan to go to the local library in the morning, I need some more track for my extra credit. In the meantime, I uploaded this which is the last in the series. This nice Fat Cat will surely top $300, maybe closer to $500. Maybe Prof_Braino will have better luck winning robot arms from Racine in the next day or so. After seeing that link on the big screen, I had to search for this, Digitized is the best way to search for an old photo. I finally got something put together, with a Hollywood star trying to run the show, to budget oversights, I payed some candy to the grandkids for toy rental. As far as the celebrity goes, his duties now are more suitable to my needs, The announcer's job was handed to a in-house talent. The slapping around you here in the videos, are the QuickStart and associated breadboard's, held in by breadboard jumpers. I wished I graphed the accelerometer. There's no room at all with a camera mount, I need the command deck cleared. That was cool. I like the bot cam on top. How about tomorrow for that video. MikeDYur is a total badass and my new Figure 8 hero! A deftly-steered bot and hands down the best video production, lighting, set deco, and special effects in the whole doggone thread! Congrats to Commander Mike for raising the bar! Loving all those 8's! I am deeply honored, it is a crowning achievement to my hobby or passion, depends on who looks at it. Here is the FPV, the audio is lousy and I see I have a steering jitter. To top it all off, my sky cam was set to low resolution. I had to include two things that were not in the video, Robbie we lost satilite link!, and lighting the candle. All the "8" décor is just icing on the cake. Fabulous, I'm in tears! I'm slightly motion sick, but that was a riot. He just shamed me into blowing $2 on a phone camera tripod: http://www.ebay.com/itm/Mini-360-Fashion-Rotatable-Stand-Tripod-Mount-Phone-Holder-Bracket-For-iPhone/301636576701 and I'm about to build an IR-controlled, CR-servo driven turntable. Gotta stay competitive! Give me more time, I would have had a lot of animation in the scene, I had the hardware ready to twitch the wheels in the corner, but wanted to get the video done before the weekend was up. I would have went on with the project, but mommy made me clean up the grandkids playroom. A project like that can bring out the child in you, So I asked her? how come you don't make them clean up after themselves. Here is the low resolution overhead, wished I would have checked settings first, don't know if my nerves would hold out for a second take. If you go to all that trouble for the F8C, your house must surely be a wonderland of Christmas lights. Some of the outrageous houses out here have already started decorating, it takes weeks to complete. The power grids are preparing for "Blackout Friday" when the Christmas lights go on after Thanksgiving. BTW, I'd kill to have an empty room like that to play in. Alas, the houses are tiny here in LA. Model train enthusiasts take up at least two rooms with there hobby, why can't I. And one grandson thought I lost a wheel around eightball curve, and that was cool. The other grandson thought I should be spitting out movie box's alot faster. The case here is, I could put on a lavish display of lights and animation on my house and landscape, draw people from miles around, but there is enough traffic going up an down the road we thought thirty year's ago was a cow path. I just seen on the world new news about the El Nino's predicted effects on California. I wish you didn't have to worry about something else, if isn't drout, wild fires, earthquake's or the morning commute, life would be a dream. I stand defeated on every possible level. Magnificent! MikeDYur has raised the bet and is ALL IN! I think we have a winner - erco! I brought together a few old photos, that show that precision is everything in robotics. And a new video, which is somthing we talked about on the Parallax Forum, how servo's would climb up a wall, if given tires that were sticky enough. Can't compete with MikeDYur's production values so heck, I won't even clean the floor. That time of the month again, another bot for another article. 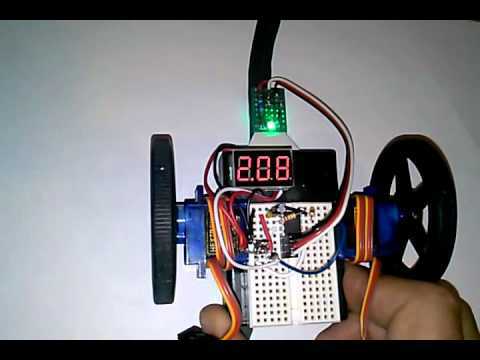 Simple CR servo bot built up quick and makes short work of F8C then celebrates with a 3-speed straight drive demo. Like my Corvair, she pulls a bit left at max speed. Unlike my corvair, this bot uses two HXT900 servos modified for continuous rotation. Same bot line following an 8. The only noteworthy feature is that it uses a single-pin sensor. Two old-school photocells form a voltage divider to give an analog signal read by an ADC. Erco, interesting that the crossing lines didn't cause a problem. I'll have to try that. Crossed lines, no problem. Just don't cross the streams, Boss. I didn't add any special code for the intersection, it just worked. It helps that they are straight lines, and nearly perpendicular. As long as both sensors see black evenly, she plows straight ahead. This type of sensor and code should work just fine on a Boebot too. It's not fast but it works. This chip only has 5 I/O pins, so I have to make the most of each pin. Is the amount of ambient light critical to accuracy? 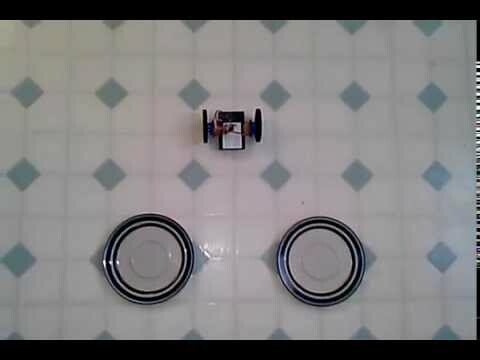 Hey, after a few mods, RoboCar gave me my fastest & funnest Figure 8s yet! Did you have some type of navigation, compass? All of your figure eight's stayed in the same general direction, a carbon copy of each other. Thanks and no sir on both counts. The green LED illuminates the line and the photocells detect the level of light reflected, more on white than black. The little PCB actually helps to block ambient light somewhat. And no compass on Robocar. I was also amazed at the consistency. Never discount brute force plus dumb luck. They've gotten me this far. 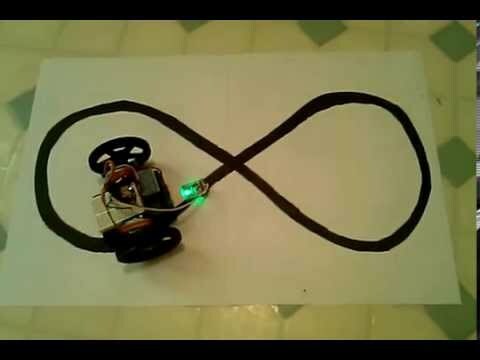 Your budget line follower looks like a good choice for my Activity Bot, with it's onboard ADC, I could dust off a couple of those old photocells, and start taping my floors. Can't wait to hear the wife's opinion. 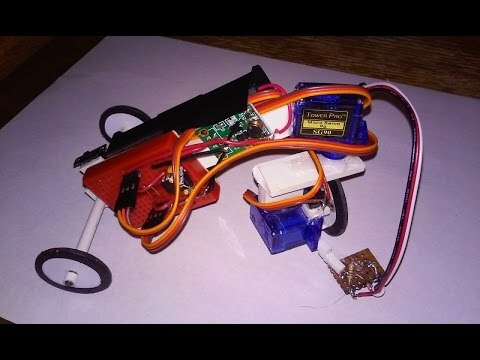 Wow, you took all the guess work out of sensor design, a can do parts list too, it will be fun stumbling through Propeller C.
Of course you have many better sensor options with a Propeller for better performance. This little minimalist robot only has 5 I/O pins, so I'm forced to do more with less. I used this type of sensor previously on a tricycle robot.